In response to a study from the National Academies of Sciences, Engineering, and Medicine [NASEM Study], the Engineering Research Centers (ERC) program piloted a planning grant opportunity in 2018. This solicitation is a continuation of the previous pilot program. The ERC planning grants are intended to build capacity in the engineering community for center-scale, convergent engineering research. The planning grant and the ERC competition are independent. Submitting or receiving a planning grant is not a requirement for participating in forthcoming ERC competitions. Prospective Principal Investigators are encouraged to read this solicitation carefully for planning grant proposal submission requirements and the ERC program priorities. The number of awards is dependent upon the proposals received and the degree to which proposals meet the solicitation goals, NSF merit review criteria, and solicitation-specific review criteria. The planning grant is for one year and the proposed budget for each planning grant should not exceed $100,000. The PI must be an engineering faculty whose main appointment is in an engineering department/school/college. Co-PIs may be from any department. An individual may be listed as a PI or co-PI on only one planning grant proposal. The 2017 study from the National Academies of Sciences, Engineering, and Medicine [NASEM study], “A New Vision for Center-Based Engineering Research”(https://www.nap.edu/catalog/24767/a-new-vision-for-center-based-engineering-research), recommends that the National Science Foundation (NSF) place a greater emphasis on forming research centers focused on solving convergent problems that address challenges with significant societal impact. Convergent problems require the integration of knowledge, tools, and ways of thinking from physical, mathematical, life/health sciences, computational sciences, social sciences, and engineering disciplines. A deeper explanation of the convergence concept can be found in a 2014 National Academies report, “Convergence: Facilitating Transdisciplinary Integration of Life Sciences, Physical Sciences, Engineering and Beyond” (https://www.nap.edu/catalog/18722/convergence-facilitating-transdisciplinary-integration-of-life-sciences-physical-sciences-engineering) and in the NSF’s Big Idea: Growing Convergence Research at NSF website (https://www.nsf.gov/news/special_reports/big_ideas/convergent.jsp). The NASEM study further recommends that NSF invest in a deliberate, early-stage process for the development and formation of the best research teams to tackle complex, high-impact societal problems using the Team Science best practices defined in “Enhancing Effectiveness of Team Science” by the National Academies (https://www.nap.edu/catalog/19007/enhancing-the-effectiveness-of-team-science). According to this 2015 report, challenges for team science arise from seven key features: (i) highly diverse team membership, (ii) deep knowledge across disparate disciplines, (iii) the large size of the team, (iv) alignment of goals across all members of the team, (v) wide geographic dispersion, (vi) permeability of team boundaries, and (vii) high task interdependence. Following the NASEM study recommendations, the ERC program is placing greater emphasis on societal impact, convergence, stakeholder community, and team formation. The ERC program will support planning grants to facilitate the engineering community in forming and enhancing convergent research collaborations. team formation, including effective leadership/management. Given the complexity of the proposed endeavor, NSF recognizes that many teams will identify an important societal challenge but may not have the full complement of skills needed to successfully address the challenge, or may lack effective relationships with their stakeholder community. For these types of challenges, the planning grants can be used to support team formation activities (e.g., filling expertise gaps), to develop and nurture relationships with the stakeholder community, or to access specialized frameworks or resources needed to address the proposed challenge. The goal of the ERC program has traditionally been to integrate engineering research and education with technological innovation to transform and improve national prosperity, health, and security. ERCs are expected to build capacity while creating an inclusive culture to support engineering research, discovery, education, and technological innovation producing significant outcomes within the 10-year timeframe of NSF support. 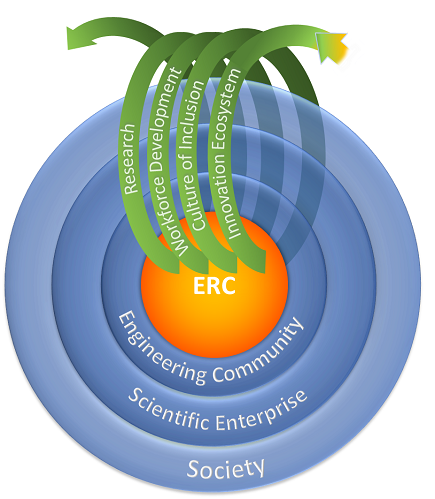 As illustrated in Figure 1, the impacts of the ERC program overall are expected to grow in scale from the engineering community, shown in the circle closest to the ERC, to the scientific enterprise, and then to society, where the largest impacts are felt. Potential outcomes of ERCs are organized within each of the four interconnected ERC foundational components: research, engineering workforce development, diversity/culture of inclusion, and the innovation ecosystem. These foundational components are carried out in concert through ERC activities and in alignment with the Center’s strategic vision and targeted societal impact. In this context, NSF is interested in using ERCs to develop engineered systems, which, if successful, will have a high societal impact. The approach to the engineered systems challenges resonates with NSF's emphasis on convergent research, one of the “10 Big Ideas for NSF Future Investments” announced in May 2016. The complexity of convergent endeavors underscores the importance of purposeful team formation, including effective leadership/management, and the development and nurturing of stakeholder communities. The bolded terms in the above paragraph are defined below. Societal Impact represents opportunities and challenges that may be addressed through advances in engineering research and innovation for the benefit of society at large. Potential societal impact should be relevant and complex, and not limited to any specific schema of grand challenges. Convergence is an approach to problem solving that cuts across disciplinary boundaries. It deeply integrates knowledge, tools, and ways of thinking from life/health sciences, physical, mathematical, and computational sciences, engineering disciplines, and beyond to form a comprehensive synthetic framework for tackling scientific and societal challenges that exist at the interfaces of multiple fields (NRC, 2014). This aligns with the NAE study‘s definition of convergent engineering as a deeply collaborative, team-based engineering approach for defining and solving important and complex societal problems (NAE, 2017). Convergent research has the strong potential to lead to transformative solutions or new fields of study. Stakeholder Community includes all parties who may contribute to the ERC or may be impacted by the ERC along its capacity-building and value creation responsibilities. For example, stakeholders can include but are not limited to relevant researchers across partner institutions with complementary research and education expertise; industry leaders who can guide the innovation effort; partners for innovation, education, workforce development, and diversity; and beneficiaries of the ERC outcomes (community members, users, customers, patients, watchdog organizations, and policy-makers). Team Formation is the process by which all necessary disciplines, skills, perspectives, and capabilities are brought together. Successful teams are interdependent, multidisciplinary, and diverse and can work and communicate effectively even when geographically dispersed. Team formation includes strategies to overcome barriers to effective, dynamic teaming, including the integration of members with different areas of expertise, different vocabularies and ways of approaching problems, different understanding of the problems to be addressed, and different working styles. Resolve conflicts and build trust. It is rare that a single person will have all of these attributes; thus, a strong leader will need to assemble an executive team that covers this broad spectrum of skills. The Center Director should understand his/her strengths and limitations and be effective in assembling an executive leadership team that fills in any leadership/management gaps. Estimated Number of Awards: 30 to 40. The number of awards is dependent upon the proposals received and the degree to which proposals meet the solicitation goals, NSF merit review criteria, and solicitation-specific review criteria. The planning grant is for one year and the proposed budget for each planning grant should not exceed $100,000. Anticipated Funding Amount: $3,000,000 to $4,000,000 subject to the quality of proposals received and availability of funds. No separately submitted Collaborative Proposals will be accepted. Planning grant proposals must contain the items listed below and adhere strictly to the specified page limitations. No additional information may be provided as an appendix or by links to Web pages. Figures and tables must be included within the applicable page limit (described below). Planning grant proposals that are not compliant with the guidelines will be returned without review. The submitting organization is responsible to ensure compliance with the guidelines. The initial team configuration at the planning grant proposal stage is recommended to include the Lead PI and up to four Non-Lead PIs who may come from any or all of the potential domestic partner universities for a future ERC proposal. No separately submitted collaborative proposals will be accepted. Planning grant proposals should be submitted as Research proposals and follow the guidelines specified in the NSF PAPPG Chapter II.C.2, unless otherwise specified. Title of Proposed Project: The title should begin with “Planning Grant: Engineering Research Center for” followed by the rest of the title and the Center acronym. Project Summary (1 page): The Project Summary must be prepared in accordance with the guidance in the PAPPG, with the following supplemental guidance: The Overview Section should begin with a heading titled “Proposed Vision”. Currently Planned Proposing Team: The description must start with a table that has four columns: (1) Name of the PI or Co-PIs, (2) Institution(s), (3) Department(s), and (4) Most Relevant Field(s) of Expertise. There will be up to five rows, one for the PI and one each for up to four Co-PIs. Targeted Societal Impact: Describe the specific societal impact(s) that the intended ERC will potentially target. Rationale: Make the case for why an ERC is appropriate and why a convergent research approach is needed for the targeted societal impact. Identify some key, enabling ideas that will be built upon. Describe the intellectual approach and qualifications for carrying out the proposed strategies. Expected Benefits: What would the planning grant enable that isn’t currently in place? Stakeholder Community: Describe the proposed strategies that will be used to better understand and engage the stakeholder community most appropriate for your ERC. The stakeholder community should be identified with consideration of all key components of the ERC. Team Formation: Describe the proposed strategies that will be used to identify and bring together the best team, including effective leadership/management, to address engineering challenges for the targeted societal impact. Planning Procedures Please describe in detail how you will use this planning grant. Include possible dates, locations, participants, objectives and outcomes of proposed planning meetings or activities, and any other relevant information. Anticipated Impacts: What aspects of the proposed approach would be most likely to change as a result of the activities described in this planning grant? Where do you see the planning grant having the most impact? What are the anticipated impacts of the activities listed in the previous section? How do you assess these impacts? Deviation from the PAPPG: Proposers are not required to include the results from prior NSF support in the Project Description. References Cited (maximum 3 pages): See PAPPG for format guidelines; the submitting team may be asked to submit a BIBTEX file of the references at a later date. Biographical Sketches (2-page limit for each): See PAPPG for guidelines. Should be included for the PI and up to four co-PIs responsible for managing the planning grant. Budget: Budget justification should explain how the budget allocation supports the overall goal of the planning grant. Reviewers will closely examine all allowable expenses such as Salary/wages, Materials and supplies, Travel, Participant support costs for planned workshops, and Other (specify). Proposal budgets should include travel funds to support one PI or co-PI to attend two NSF-sponsored cohort meetings. The planning grant is for one year and the proposed budget for each planning grant should not exceed $100,000. The following sections should be included in the proposal, in accordance with the guidance in the NSF PAPPG: Current and Pending Support; Facilities, Equipment, and Other Resources; Data Management Plan; Postdoctoral Mentoring Plan; Collaborators & Other Affiliations Information. No other items, letters of collaboration, appendices, or supplementary documents are permitted: If any supplementary documents and appendices are submitted, the planning grant proposal will be returned without review. Is the proposed strategy appropriate for developing a potential ERC including all four foundational components defined above? Is a convergent research approach needed for the targeted societal impact? Are the proposed strategies for engaging and developing the stakeholder community appropriate? Are the proposed strategies for team formation and developing the ERC management structure appropriate? Does the proposal clearly identify what will change/improve as a result of the planning grant activities?